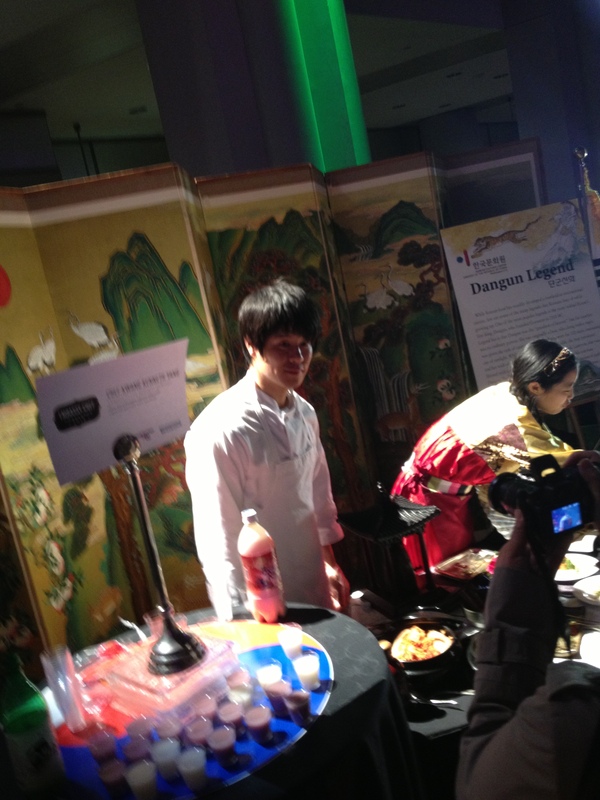 Chef Kwang Kenneth Yang of South Korea. Chef Ismar Reyes of El Salvador. And cured cod, potato and leek soup, and aquavit from Norwegian Chef Simon Liestoel Idsoe. Chef Simon Liestoel Idsoe of Norway. 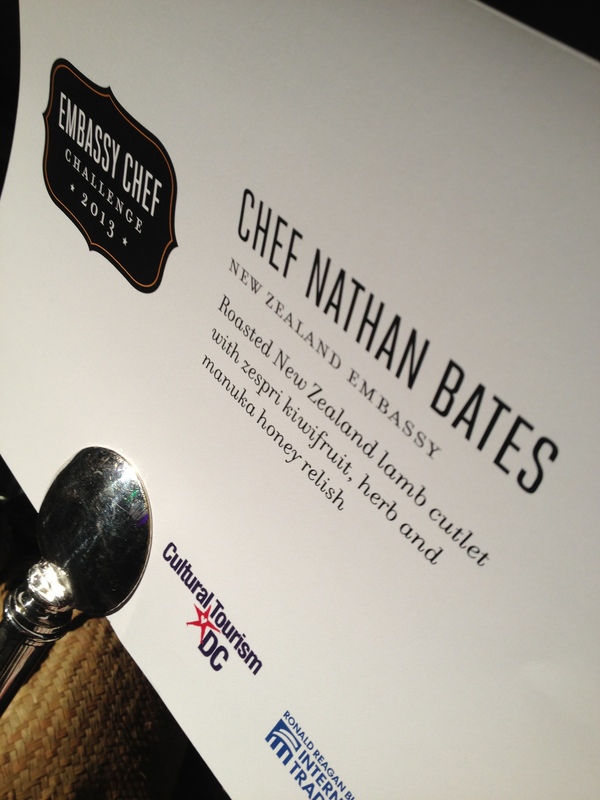 Chef Nathan Bates of the New Zealand embassy was victorious with his lamb dish. The best part of the night, though, and what I want to write about, is the potential this event has for the field of Culinary Diplomacy. Many of the people with whom I spoke that night had never heard of the term, or the field, and asked me what I meant. I gestured around us, to the throngs of well-dressed folks crowding chefs usually sequestered to their embassy kitchens asking about chipilín, biltong, and manuka honey. 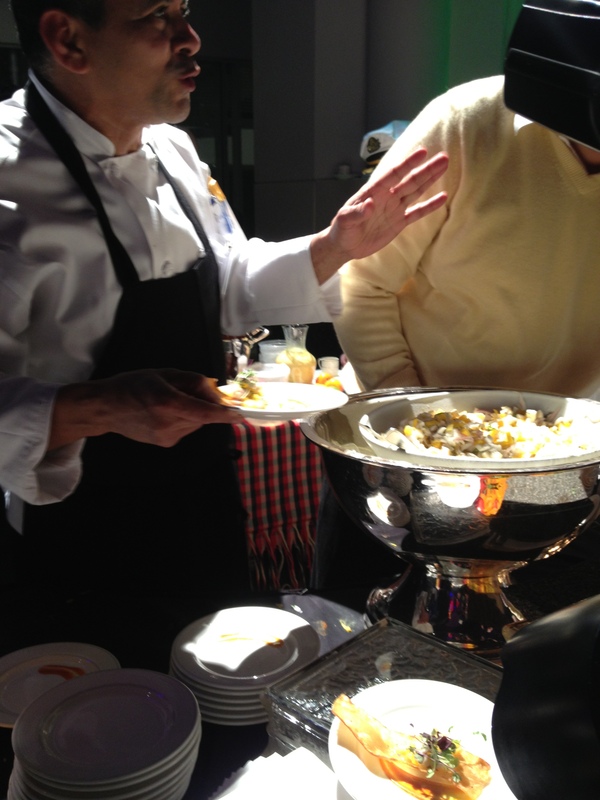 The attendees and chefs were engaging in active culinary diplomacy before our very eyes! And for anyone interested in asking chefs their thoughts on the topic, more often than not the chefs were enthusiastic to reply. Chef Mukesh Ramnarine of Trinidad and Tabago, AKA Chef Tiger, when I simply mentioned the term “culinary diplomacy,” waxed poetic about using food as a “peace tool.” The South African chef, Chef Zodwa Sikakane, lit up when I told her my topic, and started speaking rapidly about the work her embassy and her country was doing to lead with their cuisine. Her enthusiastic flow was cut off only when the emcee demanded the chefs’ presence on stage. This is great. We need more events like this. As I’ve stated before, I define Culinary Diplomacy as “The use of food and cuisine as an instrument to create a cross-cultural understanding in the hopes of improving interactions and cooperation.” This is what we were all doing at the Embassy Chef Challenge. 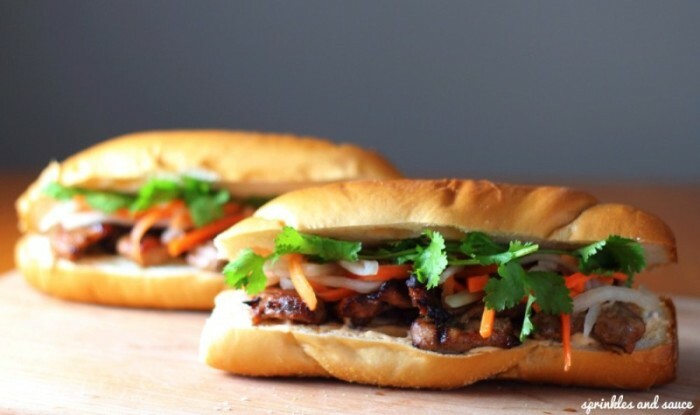 The chefs had the opportunity to showcase their cuisines and their skills to a wider cross-section of the population (see next paragraph for my major caveat, though). They usually cook for their ambassadors and guests, not the wider public. Especially not the wider American public. Attendees, too, may have sampled these cuisines, but rarely if ever have access to national culinary representatives in this way. My caveat is this. I want to point out that this was truly private culinary diplomacy, as opposed to public (or in Paul Rockower’s conception, pure “culinary diplomacy” and not “gastrodiplomacy” – read here for more on definitions). It was a $250 event in downtown DC, completely inaccessible to a vast majority of people. My fellow attendees by the end were spending thousands of dollars in a silent auction on lavish trips around the world and very private culinary diplomacy experiences in ambassadorial residences around DC. This is certainly only one of many tools available to Culinary Diplomacy promoters, and should only be one of many opportunities available to Culinary Diplomacy enthusiasts. 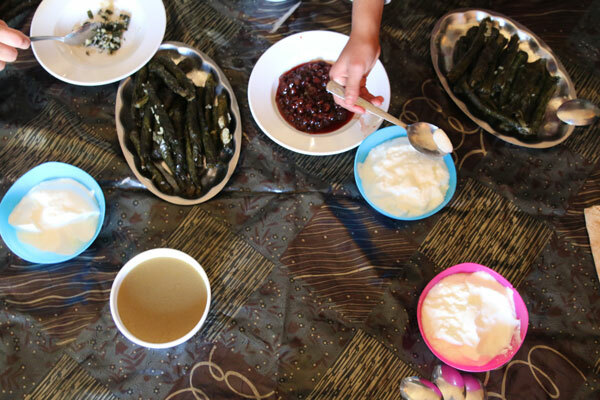 Passport DC, another Cultural Tourism DC event, opens embassies to the public — I hope embassies consider including some of their national cuisine to welcome visitors. I’ve discussed other tools before, and scholars like Mary Jo Pham and Paul Rockower have written great articles about the tools used by South Korea and Taiwan. As more and more people get interested in and enthusiastic about the field, it will be able to be enjoyed more of the population. 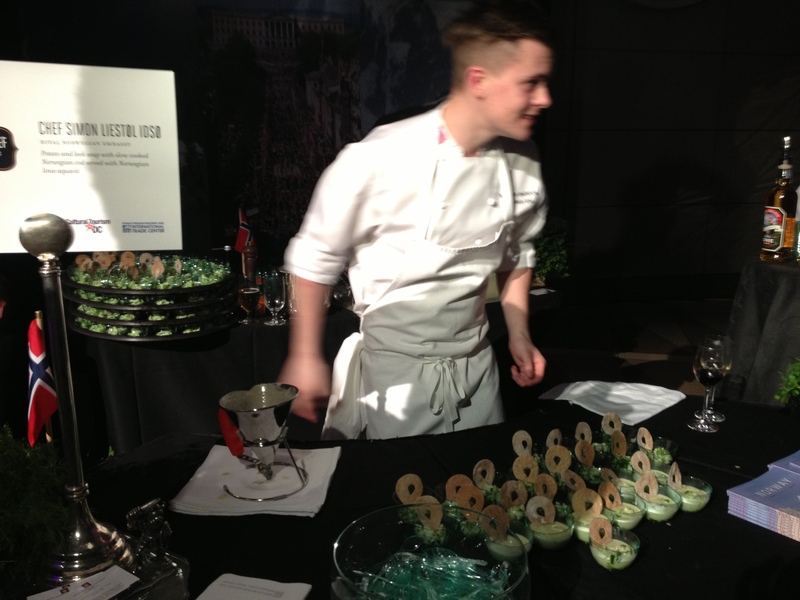 In sum, good job Embassy Chef Challenge for creating a potent Culinary Diplomacy event. Although highly exclusive, it provided a good venue for chefs and the public to interact. We certainly have a long ways to go, but we are moving forward. I would love a “street food” cookoff event, where “culinary ambassadors” (aka local street food vendors from around the world) serve up some of their best dishes, speakers from the various countries represented give a glimpse of the culture that the various foods represent by describing the culture/tradition/ingredients behind the dish (with photos and videos, of course). And don’t forget the beer and wine tent, with tasty refreshments from around the world! And tickets would be cheap and open to the public. Too “pie in the sky”? hi, im so interesting with culinary diplomacy in Thailand . im doing final assignment about that but im yet found whats the background thailand use culinary diplomacy. its just pure for promotion their culture or kind of their recovery from crisis economy at 1997?